Speaking as a somewhat early adopter who had done the same ROI calculations, I’ve found that none of my CFLs have made it to five years. It would be cheaper to buy new ones than to go through the warranty process as well. Not only that, the warm up times are still unacceptable, the color spectrum is still sub-par even with the warm 2700 incan temperature CFLs, and some of my CFL ballasts are noisy. High end LEDs do seem to completely outclass CFLs in every department except ROI, so it looks like I’ll be using halogens until that time. Very interesting post. I would suggest two other things to consider. 1) What is the embedded energy cost in the working light bulbs you are throwing away and the CFLs you are replacing them with? There is a good chance that you are getting subsidies for both the energy and the environmental damage being done by throwing them away, which comes back in the form of higher taxes. Hard to quantify how much comes back, but not so hard to quantify the raw costs. 2) Are CFL life-spans getting shorter as the bulbs get cheaper? I have several giant old CFLs that I bought over 15 years ago (when they were $10-$15 each) and they are still going strong after my 4th or 5th different move. In contrast, a lot of the ones I bought in my last apartment didn’t survive long enough to come with me for the latest move. There’s not much embedded cost in an incandescent bulb, since they’re so cheap (25 cents each last I looked). This implies that the energy cost of production is low as well. Running a 60W incandescent bulb for more than 41 hours or so consumes more than 25 cents worth of energy, at 10 cents per kWh. 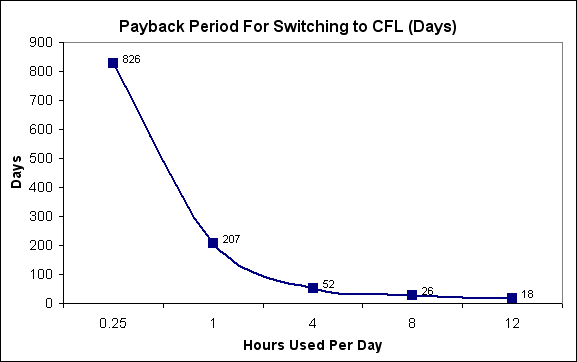 I do think that the lifespan of CFLs may be going down on as manufacturers try to compete on price. I’ll have to see how this latest 97 cent variety hold up… in my calculations, I did use a lifespan estimate around 35% less than the manufacturer’s claims, to try to account for this.